Inbound marketing isn’t just for consumer-facing companies. In fact, for many B2B companies, especially in what we often refer to as “high involvement” markets, long and complex sales cycles mean a lot of information must be exchanged with a prospect before a sale is made. 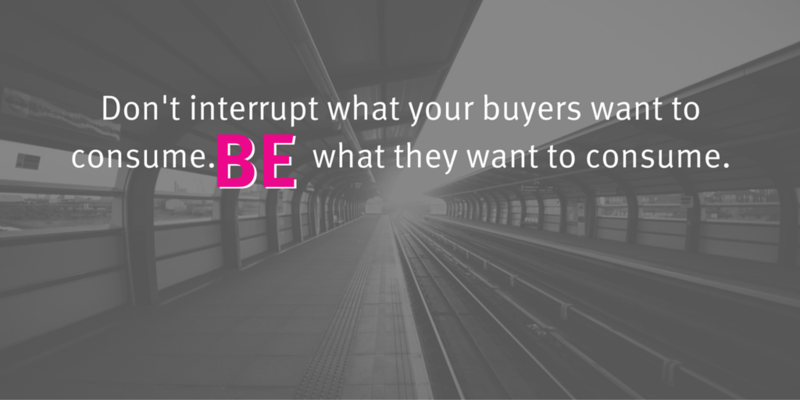 This creates a perfect situation for inbound and content marketing to become effective. Inbound marketing refers to marketing activities that bring website visitors IN by providing the information they are seeking, rather than going OUT and interrupting people with messages or ads in which they are not interested. Inbound is a process of aligning content and information with a prospect’s needs in a way that nurtures the relationship from site visitor to lead to customer. Instead of using “old” outbound methods such as buying ads and sending email to purchased lists, or cold-calling prospects, inbound relies on quality content, online conversations and SEO to bring prospects to your website. You then build a relationship with these people over time by continuing to offer useful information and relevant insights to them. delivers information (content) that helps them make better buying decisions through a variety of online, social media and email channels. The way customers seek out information has in undergone a fundamental shift over the last decade. Customers are actively seeking out new information channels and sources of authority in their fields. They want to know how to do their jobs better, and look for resources that can help them do that. Customers no longer wait for a sales person to call to get information about a product that may help them do their jobs better. In fact, company websites may not even be the first line of information gathering for many people. They check out social media sites or peer-facing discussion pages, or whatever comes up first on Google. Simply pushing product information out through advertising on mass media doesn’t work. You need to have your information timed to what the customer needs to know, not tied to your internal marketing cycles. Customers are looking for solutions to their problems. And looking for ways to help them do their jobs better. They turn to the Internet for information, advice and recommendations from their peers on what works. If a potential customer searches on “how to get better results in (insert your area of expertise here)”, will they find information related to your company or product’s business area in Google? Have you created the online content that helps people looking to solve a problem consider your product in their frame of reference? If they’re searching, and you’re not there offering the information they need, where will they get that information? Probably from people who know less about your market that you do, and potentially from your competitors. Creating this sort of “top of funnel” content is what makes the difference for inbound marketing – and for successful sales in today’s online world. Inbound marketing software solutions like HubSpot, help you manage, monitor and analyze your marketing activities in order to generate high quality leads that more readily convert to sales. By nurturing your potential customers through the sales funnel with the right content provided at the right stages, you can shorten the sales cycle and make the sales person’s job easier. Inbound Marketing Report- How do marketing priorities differ around the globe?